Asian art and philosophies have influenced his highly altered forms. The process begins with days spent constructing the large sculptural structures using traditional hand building, wheel, and slab techniques that will ultimately display the deep matte reds, oranges, and yellows that have become a distinctly Artman trademark. The vessels are then bisque fired to a low temperature allowing the clay body to become an open, porous structure able to withstand the thermal shock encountered with later firings. 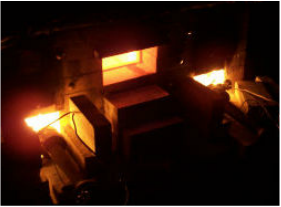 Once the bisqued forms are sprayed with a series of glazes, the work is reduction fired in a gas kiln to 2100 degrees Fahrenheit until the molten sides glow like white hot embers. The colors are purposefully mottled to give the sculptures a weathered, well worn appearance. The firing process takes the clay and glaze elements back to their earliest origins of the earth itself when various materials were being born out of and separated in the molten magma. Artman’s vessels depict power, containing life and purpose. Forceful and intense, the immediate impact is a sensibility of strength from all points of view – an achievement of quiet grace.